It’s well known that Meghan Markle and Amal Clooney consider each other close friends. Clooney was, after all, one of the select few to attend Meghan’s baby shower in New York last month. But let’s be honest—real friendship is sharing where you shop, and it seems the two women have been trading personal style secrets, specifically where they buy their vintage wares. Both Meghan and Amal have been spotted wearing gorgeous statement pieces from London vintage clothing boutique William Vintage. Amal, at a recent dinner celebrating the Prince’s Trust International, wore a striking 2007 Jean-Louis Scherrer by Stephane Rolland Grecian-style gown, and Meghan was spotted in a gorgeous Courrèges Haute Couture black trapeze coat in matelassé silk circa 1965 on her recent trip to celebrate her baby shower in New York. Like Meghan, Amal also happened to wear William Vintage pieces throughout her pregnancy, and they aren’t the only fans of the store. Rihanna, Emma Watson, and Bella Hadid have been spotted in unique pieces from the famed dealer. While it may not be the easiest feat to get across the pond to the brick-and-mortar store in London, luckily you can now shop the unique clothing online at Farfetch. The pieces may be pricier than your average vintage store, but you can be certain that these stunning, one-of-a-kind items will incite plenty of compliments and are sure to last you a lifetime. Plus, you don't have to worry about anyone turning up in the same outfit as you. See some of their most stylish looks from the store, and then hop on the Amal-and-Megan sustainable bandwagon, and shop the exquisitely curated vintage pieces from William Vintage below. 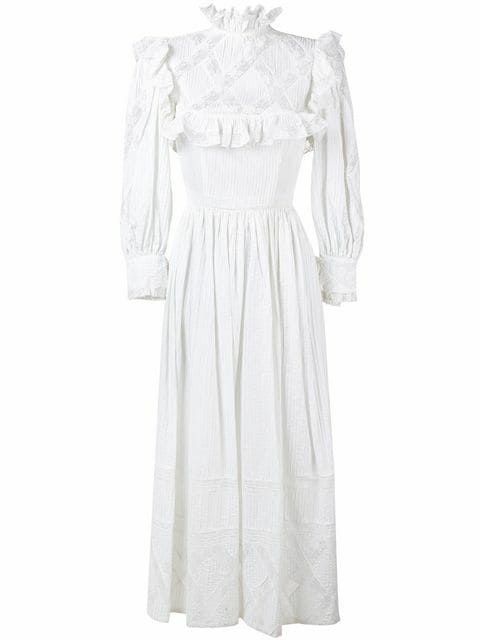 Nail the prairie dress trend in this charming stunner. Classic and timeless. We could definitely see Amal in this one. Leather separates are so on trend right now. This one is timeless. Your evening outfit is craving this striking bolero. How gorgeous are the bow details? Here's how to stand out from the crowd. The oversize silhouette makes this perfect for expecting moms. This would look ridiculously cool with a simple fitted white tee. Getting married? This is one mighty fine option. From baby showers to weddings, this is the ideal spring frock for every upcoming soirée.